Mont-Saint-Michel and its Bay is characterized by the rocky tidal island that holds a 11th century Benedictine abbey and a fortified medieval village. The complex was built at a unique natural location, resulting in an unforgettable silhouette. The tides in the Bay can vary greatly, at roughly 14 metres (46 ft) between high and low water marks. The coastal flats have been polderised to create pastureland. The monastery was an important place in medieval Christianity. It was dedicated to the archangel St Michael. The first monastic establishment here dates from the 8th century. The mount is depicted in the Bayeux Tapestry, which commemorates the 1066 Norman conquest of England. Norman ducal patronage financed the spectacular architecture of the abbey in subsequent centuries. The core zone also includes the Old Windmill of Moidrey, which is located on the top of a hill adjacent to the Bay. The Mill was built in 1806 to produce flour. I saw this iconic pyramid for the first time about 12 kms away, from the small road that leads from the motorway to the entrance of Mont Saint-Michel. Its visible impact on the horizon was exactly the same as I had experienced a few years ago at Uluru in Australia: it’s like a magnet, you want to get there as soon as possible. As the thing has been there for ages, there’s no need to rush though. When I arrived (at about 9.50 a.m.) the car park had already some 100 cars in it. This is just a fraction of what it can hold – facilities are gigantic, a bit similar to parking at a large airport. One can take a free shuttle bus from there to the foot of the hill, but I decided to walk the 3km so I would be able to take pictures. 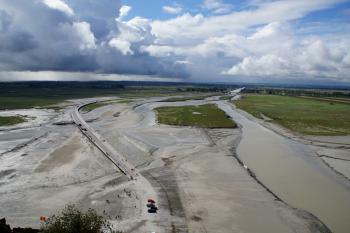 I looked in envy to the group and a few individuals that were hiking the surrounding mud flats: they must be able to enjoy the natural surroundings more ànd have views of the Mont Saint-Michel from different angles. The whole visiting experience is in the process of being changed: a dam has been built a few years ago to prevent the site’s sands from growing over with vegetation and making it impossible for the mount to ever become an island again. It’s a bit of a construction site at the moment, a large boardwalk is in the final stages of being put together and becoming the main way to enter the site from the parking lots. This distracts a little from the unobstructed views. These views are the site's best feature anyway, as I did not really fall for what has been built on top of the island. The village is small, full of souvenir shops and best-to-be-avoided restaurants. The abbey is worth entering and I especially liked the Grand Western Terrace (more views of the sand flats!). Its interior is nothing spectacular though on the scale of monasteries around the world. Somewhat surprisingly this WHS consists of another location too: according to the Unesco website, the windmill of Moidrey is part of the core zone too. 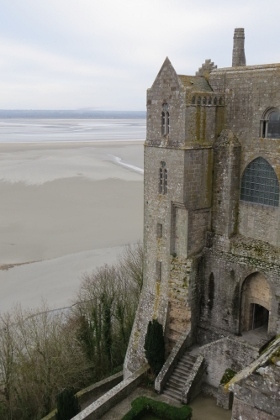 It lies about 5km from the Mont Saint-Michel, and is said to have great vistas of the mount. I had planned to visit it on my way back, but although I had written down the adress I could not find it as my car navigation did not recognize it. Mont-Saint-Michel on the north coast of France is an enchanting place to visit, especially if you stay overnight. A friend of mine had wanted to see this site since he was a kid, so when he and another friend and I were planning excursions from Paris in 2005, we made sure to add this to the itinerary. Mont-Saint-Michel exceeded our expectations. We arrived in the early afternoon, and were impressed by the walled town surmounted by an abbey rising from the sea. After climbing the winding streets we reached the abbey and monastery; the architecture and history were impressive, as were the views of the town and bay below. We stayed overnight at La Mère Poulard, an excellent hotel, and it felt like the island was ours to explore. That evening we had free rein to walk the town's ramparts and stone-paved streets, as well as watch the tide come in. We visited before the bridge and dam construction project had begun, so I'd like to go back some day to see Mont-Saint-Michel as a true island. 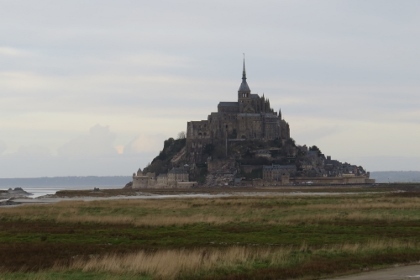 Logistics: Mont-Saint-Michel is within a day's drive from Paris, but it can also be reached by train (via Rennes or Pontorson, which is closer), followed by a bus or taxi. Even though I had seen many photos of Mont-Saint-Michel, it was a real wow-effect when I saw this pyramid for the first time. The Mont and the striking shape of the abbey are already visible from a distance, towering above the green meadows. It must have been even more awe-inspiring for the people in the Middle Ages. So it's no wonder that Mont Saint-Michel was a strategically important monastery and a famous pilgrimage site. A legend goes that Bishop Aubert had a dream in which the Archangel Michael asked him to build a church on top of the island. Initially, Aubert did not follow the order. The archangel had to appear to him again, piercing a hole in the bishop's skull with his finger. A relief in the abbey depicts this scene. Fortunately, the bishop finally obeyed, so France has another top tourist destination and an iconic WHS. We visited Mont Saint-Michel in August 2015. All the construction works are completed: the car park at the foot of the Mont has been removed and the new stilt bridge replaces the old causeway. The dam at the Couesnon river is in operation for a few years. The aim of this project is to flush the deposited sediments out of the bay and to increase the depth of the water around the island. So the Mont will recover its maritime character, but this will take decades. Today, the Mont is an island only at extremely high tides. Our visit was at low tide and the photo shows that not much has changed compared to Els' photo from 2013. We arrived at the new car park at quarter to 9 pm. Free shuttle buses run from the visitor centre to the Mont, but we took the sporty alternative and walked the 3 kilometres, the last 800 metres on the new footbridge. The main road, the Grand Rue, was already quite busy when we arrived, so we went directly up to the main entrance of the abbey, passing the St Peter's church and the picturesque cemetery. The self-guided tour (9 Euro) starts at the guard room, then we climbed an external staircase to the highest point of the Mont, the Western terrace in front of the entrance to the abbey church. From the terrace you have a wonderful view over the bay and the mud flats. The interior of the abbey is nothing special, the typical elements of a monastery, although it is surprising to find a cloister on the steep peak of a rock. Extraordinary is the layout of the complex. The rooms are arranged in a downward spiral around the rock, the way down takes you over numerous stairs through vaulted halls and crypts with massive pillars. The lower rooms support the upper parts. The history of the abbey began in the 8th century and it was rebuilt and extended in the following centuries, so it is a mixture of several architectural styles, but the result is impressive. We took the ramparts walk for the descent to the foot of the Mont. It's more pleasant than the main road, but also lined with souvenir shops and overpriced restaurant. Were these the back doors of the restaurants on the Grand Rue or different ones? We paid no attention to their menus and left the Mont rather hungry, because we were looking forward to another highlight on that day: Cancale on the opposite side of the bay, famous for its oyster farming. Cancale is a busy and picturesque harbour, the quay is a long row of stalls and restaurants. We had a late, but delicious lunch with oysters and seafood. We stayed at Saint Malo, which I can also recommend. Saint Malo has a nice town centre and many lovely shops, perfect to look out for souvenirs from Brittany. We finished the day with more local delicacies: Galettes and a carafe of cider. Happened to be there the day the farmers demonstrated in late July 2015. It is a wonder of a site. You have to have a reasonable good ability to climb stairs. Overcrowded and a tourist trap but fantastic anyhow. I visited in Summer 2011 and could admire this WHS in low and high tide. I saw Puccini's Madamme Butterfly en plein air just in front of the WHS and it was truly an unforgettable experience. I explored the rocky tidal island with a tiny population of only 44 people. In the morning when the tide retreated I walked all the way the to Channel Islands following some tourist groups from afar to be sure to avoid the quick sand zones. It is certainly one of the most beautiful WHS France has to offer. Mont St.Michel is one of the most famous and recognizable sights in the world, and one of the best-known symbols of France. Known as the Wonder of the West, or Merveille de l'Occident, it is famous as much for its artistic, cultural and religious significance as for its unique location on a small island off the Norman coast. Though it is visited daily by countless tourists and pilgrims, it is quite well managed, as many people stay in the restaurants and tourist shops of the village at the foot of the mount. It takes a bit of effort to reach the abbey at the top (which charges a fee), but this is certainly worth it, as the abbey is really a great and very interesting building. There are also several museums, but those are overpriced and only mildly interesting, and only recommendable if you have some time on your hands. To reach the mount, I stayed in Rennes and took a bus, which was quite convenient and trouble-free. 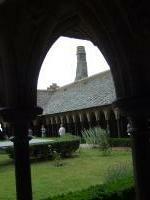 There are also bus connections to the villages of Pontorson and Dol-de-Bretagne, but of course Rennes is a large city with several sights of its own. 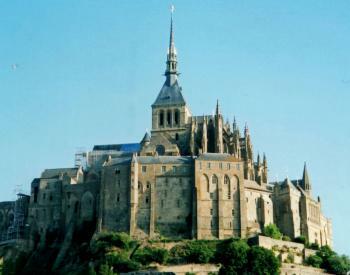 It should be noted that, similar to the cathedrals of Amiens and Bourges, Mont St. Michel is a double inscription as part of the Routes of Santiago de Compostela. 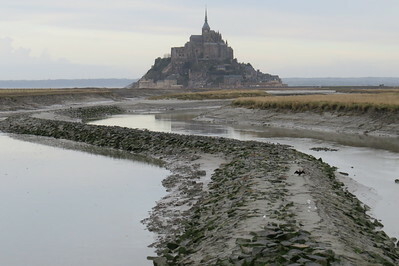 The Mont Saint-Michel and its bay have been the first French site to be registered as a WHS in 1979. The great abbey is the main attraction of the Mont. The statue of the angel Saint-Michel is located on the top of the church tower, 170 meters high. In 709, a sanctuary started being constructed to honor the angel Saint-Michel. In 966, the Benedictine abbey was erected. Then and for centuries, edifices have been set up on the Mont until the current abbey to be completed during the 16th century. It has been a pilgrimmage site and a prison but it has always keep its religious value for people. The little rock island, situated in the bay, is now linked to the continent by a dyke with a road. 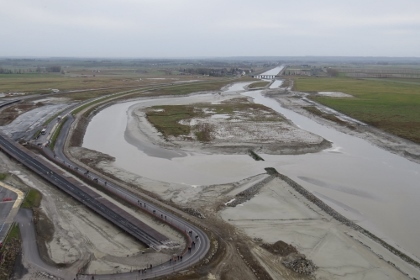 However, this dyke is planned to be destroyed and changed into a long bridge to allow sediments and sand to flow without being stopped. These sediments were creating sand mounts risking to change the island into a part of the continent. The bay surrounding the Mont is the place where the biggest tides in Europe occur and welcomes a great diversity of fauna and flora. I have visited a lot of sites in my life and the Mont Saint-Michel is for me one of the best ones. This quiet and marvelous place bewitches visitors and makes them fall in love with its beauty. In July 2009, I took my son and two grandsons to tour the Normandy battlefields[my brother was in second wave at Omaha beach-three of us are navy veterans. We stayed in Ponterson and made a trip to Mt Saint Michels. The first view of it was awesome and the visit to the Abbey and surroundings was history firsthand; but the thing that we all remember about the visit was the number of people walking far out on the tidal flats, apparently they were experienced in the high tides period because we observed a picture of the island completely surrounded by water. The visit was one of the hightlights of our trip. I stayed in the village of Pontorson and caught the bus to Mont St Michel from outside Pontorson station. It went right across the causeway and stopped at the entrance to the Mont. There are also direct buses from Rennes station that stop there. Despite the huge number of visitors the abbey appeared well organised with no congestion as visitors follow a set route from the nave through several chapels, the cloisters and crypts and back onto the steps again. 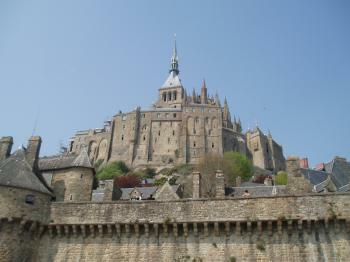 Since I first saw a picture of Mont St Michel I thought: "Someday I will be there"....this March my dream came true. This is the most fantastic, ethereal, incredible place I have ever been. It is like a dream, unbelievable. I am a lover of medieval architecture and gothic chatedrals and monasterys. My wife and I spent the night at one of the hotels in the island, so we could see the magnificent dusk and then at night the structure became illuminated and it was awesome. Specially at night, when tourists leave the place, you can stroll and wander the narrow streets and you can feel a lot of peace and comfort, very good karma. Go there!!!!! and spend one night, it is worth it. Mont-Saint-Michel is impressive and truly one of the symbol of France. It seems to me that many people have a problem of public transportation for visiting this place; the easiest and quickest way (that you can make it as a day trip from Paris) is take TGV to Rennes, a lovely capital city of Brittany and then take a hourly special shuttle bus to Mont-Saint-Michel which parks in front of the train station. This bus will take you to the main gate of the island. 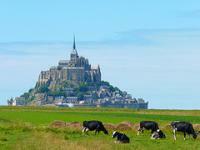 SNCF also provides a special train to Mont-Saint-Michel in Summer. This is one of the earliest inscriptions on the World Heritage List, and is defiantly deserving of its place, the outline of the island and the abbey that crown it are so well known that it felt like a really familiar place when I finally managed to visit it. I first saw the island some 12 years ago but I finally managed to ‘tick it off’ with a day trip on a glorious Saturday in April 2006. The abbey on top is the main focal point and has evolved pretty much continuously from its founding by St Aubert in 708. It is actually quite a feat of engineering with later additions to the buildings using the foundations of the earlier incarnations as their support. In fact the rear of the abbey is called ‘la Merveillle’ (the marvel) due to the way its splendid gothic features perch on a fairly precarious position. The tour of the abbey starts in the cathedral at the very top and spirals down through the many levels and is very well laid out. Le Grand Rue is the other part of the island and this is the main road up the abbey entrance, it is actually quite nice, however it is cluttered with overpriced restaurants and purveyors of tourist tat (if you desperately want a plastic Mont or a replica lord of the rings sword look no further!). It is worth ducking in to St Pierre’s chapel which is nicely decorated and has scallop shell motifs on the bénitier/ stoup highlighting it’s place on the route to Santiago de Compestella. The tide (the bay has the second fastest tides in the world) was out when I visited so we were able to walk a lap around the base of the island, which gave a new perspective of the great walls on the town, which still has a population of 53 and is a member of the Organisation of World heritage Cities. Despite this being the most visited site in France outside of Paris, it is actually quite a difficult place to get to on public transport as trains and buses are so infrequent they serve no practical purpose for a casual visitor (I discovered this the hard way on a failed attempt to visit in 2004). If you are looking for places to base yourself nearby you can’t go to wrong in St Malo, which is a great walled city about an hour West. Mont Saint Michel is a great site, and if you can handle lots of tourists is a rewarding destination. a more unique man made place. One year as we approached Mont-St.-Michel from the east on the 'little' road near the coast, our first sight of the cathedral was across a mile of grassy pasture with grazing sheep and cows in the foreground. Once we arrived at the point where the causeway leaves the coast, there were still two kilometers of awe and wonderment as we continued to the parking lot near the Outer Gate. One evening, as the sun was setting through the clouds and the floodlights were gradually illuminating the Abbey, we walked the two kilometers from the mainland and took twenty-five or thirty photos of the ever-changing ethereal scene in front of us. 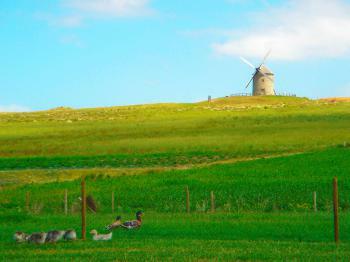 Polders: "Around the Bay of Mont St. Michel is polder land ? farmland reclaimed by Normans in the 19th century with the help of Dutch engineers"
Built in the 11th century: William de Volpiano designed the Abbey in the early 11th Century. 379 Community Members have visited.